The Irish have suffered a few dreadful years, turning from Europe’s poster children, to goats. All the old familiar devils are back; mass unemployment, rampant emigration, bankers greed, made worse now in some ways, because for a few brief shining years the country saw what it could become. Then another hero comes along. Katie Taylor is an unlikely one. Daughter of an English father, an evangelical Protestant who prays and gives praise before and after every fight, she is hardly the archetypal hero we have come to expect from the Emerald Isle. But yesterday she broke all the stereotypes. Before an audience that included Kate Middleton and thousands of Irish fans singing their hearts out, she won Ireland’s first gold medal of these games and the first since Michelle Smith’s highly dubious swimming haul in 1996 in Atlanta. Ireland has only won eight gold medals in the history of the Olympics. Taylor won one of the first Olympic boxing medals for women and in the process stamped herself as one of the heroes of the games. A Cinderella sport so long ignored by the International Olympic Committee at last found its day in the sun -- and a heroine to go along with it . Don’t just take the Irish word for it. Here is what Sports Illustrated said. “Looking for the most popular athlete at the Olympics? Any list has to include Taylor. Katie Taylor might be the most popular athlete in any sport at the London Olympics,” the magazine’s website reported on Thursday. 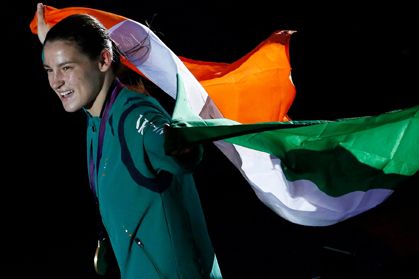 “Katie Taylor is a giant of Irish boxing, European, World, and now Olympic champion – a showman and a folk heroine. When the Irish anthem was played for the first time in 16 years at the Olympics at the London venue there was not a dry eye in the house or in Ireland or among those abroad watching. The sun came out for Ireland yesterday, after a lousy spell, and a modest 26-year old girl from Bray, County Wicklow became an unlikely hero. In the process she lifted Irish hearts back where they belonged.